Data from StatsCanada this morning showed that Canada’s jobs market contracted slightly last month, coming in below expectations after two months of exceptionally strong gains. On a seasonally adjusted basis, Canada lost a net 7,200 jobs. Market expectations ranged of 6,000 to 10,000 new jobs. Canada’s jobless rate was unchanged from the previous month at 5.8%, matching expectations. The is currently trading at the low of the day outright, just shy of the C$1.3400 handle at C$1.3384. with stronger commodity prices, the market seems interested in buying CAD on USD rallies above C$1.3410-20 in the short term. The ‘big’ dollar has been well bid in early trading on a strong non-farm payroll (NFP) headline print (+196k vs. +172k). It’s the ideal report for supporting risky assets – strong hiring, combined with muted wage growth (average hourly earnings +0.1% m/m vs +0.2e). There is nothing in today’s report to suggest the U.S. labor market is rolling over nor is there anything to suggest that inflation could pick up at a pace that pushes the Fed to rethink its dot plan. 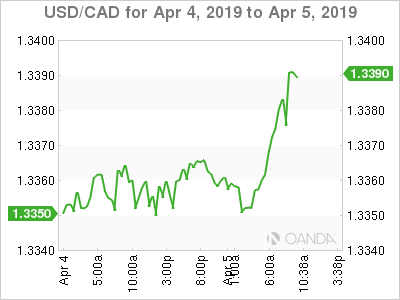 USD/CAD for April 4-5, 2019.